This entry was posted in How To and tagged Add cover art to Mp3, Add lyrics to Mp3, Edit Mp3 tags, Mp3 Manager, Mp3 Normalizer, Mp3 Tag Editor, Mp3 Tagger, Music Manager on December 18, 2017 by Zortam Support. This entry was posted in How To, Version History, Zortam News and tagged Added Mini player, Mp3 Auto Tagger, Mp3 Tag Editor, Zortam Mp3 Media Studio 23 on November 28, 2017 by Zortam Support. Application also search and inserts lyrics into your Mp3 files, searches and inserts album artwork into your Mp3 files. It can remove existing album artwork or remove complete ID3v1 and Id3v2 tags from your files. 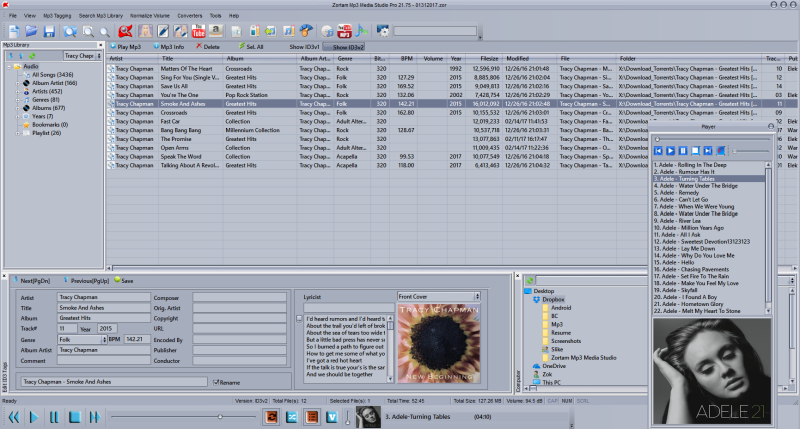 Application supports batch processing for all tagging operations including adding album artwork and lyrics. You can add or change all your tags in integrated ID3 Tag Editor, select album artwork from Internet, photo gallery or local storage, print lyrics, delete songs and much more. Application has it’s own Mp3 Player. With batch auto tagging options you can add album artworks and lyrics in the minute. All tags are properly updated with other android media music files and there is no difference between real tags in file and android media files. So any other music program can read tags saved by application. Also there is an Mp3 Player implemented into application. Zortam Mp3 Tag Editor is Mp3 tagger that fixes and organizes your Mp3 collection very fast, and it’s very simple to use with modern design. This entry was posted in Android, Zortam News and tagged auto tag, Mp3 Tag Editor on August 17, 2017 by Zortam Support. We have significantly improved the application performance. This entry was posted in Zortam News and tagged auto tag, Mp3 Tag Editor, zortam version on April 3, 2017 by Zortam Support.